For the domestic airline, see Air Tahiti. Air Tahiti Nui was established on 31 October 1996 and commenced flight operations on 20 November 1998. It is the first international airline based in Papeete, Tahiti, formed to develop inbound tourism. The government of French Polynesia is the major shareholder (84.4%) along with other local investors. Currently, Air Tahiti Nui has 782 employees. Airbus A340-300 5 — 30 0 264 294 To be phased out by 2019 by the Boeing 787-9. Boeing 787-9 — 4 TBA To be delivered by 2019. ↑ "Contacter." Air Tahiti Nui. Retrieved on 2 February 2011. "Tahiti - Siège social Immeuble Dexter – Pont de L’Est – Papeete BP 1673 – 98713 Papeete – Tahiti." 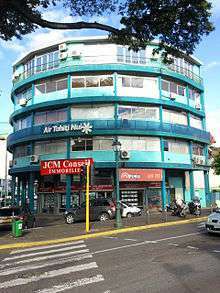 ↑ "Profile on Air Tahiti Nui". CAPA. Centre for Aviation. Archived from the original on 2016-10-30. Retrieved 2016-10-30. 1 2 "Air Tahiti Nui partners with Boeing for new aircraft". "Air Tahiti Nui has announced that it will replace its entire long haul fleet with four new Boeing 787-9 aircraft. Delivery is expected to begin during the fourth quarter of 2018, coinciding with the company’s 20th anniversary celebrations."